But it was not, worth it? If the world was saved by the death of Jesus, was it worth all the effort? Colm Tóibín’s The Testament of Mary (see review here and here) is the latest in long line of English literature based on material from the Bible. It follows in the tradition of Lew Wallace, Robert Graves, Jenny Diski, Norman Mailer and others who have reworked Bible stories. What emerges is not necessarily the Church’s teaching. The material is explored as human experience rather than divine dictat. Tóibín’s Testament tells the story of Mary, the mother of Jesus. It is both a novella and a play. 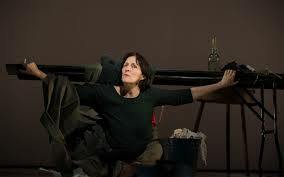 In the latter, recently finishing its season at London’s Barbican (see review here) actress Fiona Shaw plays a Mary half-crazed with grief and severely critical of the position that she has been placed in by her son and his followers. Tóibín’s is clear about his intention. Unlike the New Testament authors, he gives Mary a voice. He visualises her living in exile resenting the custody of her ‘guardians’. He tells her version of the events of the last few days of Jesus, using mainly material from John’s gospel and, in particular, the story of Lazarus, the man Jesus raised from the dead. In the week that Fiona Shaw completed her final performance of Colm Tóibín’s The Testament of Mary at the Barbican theatre, St Paul’s Cathedral announced the arrival of ‘Martyrs’. This is the first of two video installations by Bill Viola and Kira Perov that will enhance the power of the St Pauls to explain what faith makes people do. The full title is ‘Martyr (Earth, Air, Wind Water)’ and depicts the agony and death that each element can inflict on a martyr. Intriguingly the other video will be about Mary. Tóibín’s Mary is a severe, grief stricken mother deeply distrustful of what has become of her and her son. His name she cannot speak; for he had inflicted too much on her and for little good that she could see. The play ends as it begins with a wry, cynical questioning of his followers’ claim that the death would change the world. Twice Mary says: it was not worth it. What he endured, what she suffered, was too high a price. But in the second saying of it there is a hint of a question. But it was not, worth it? Martyrs raise the same question. There are always people who believe their death will make a difference. There are always those who believe that their death is the cost they will pay for what will change things for good. In a recent article in Christian Aid Magazine Susan Durber, Christian Aid’s theology coordinator, reports the astonished reaction of a BBC1 Question Time audience to Jeanette Winterson’s use of the words of Jesus to back up her point in a discussion about poverty. Durber expresses her delight at the warm response Winterson received. This is unsurprising after all Winterson’s comment supports Durber’s own view of Jesus as the radical subversive. For the Christian Aid theologian declares that ‘to be Christian is to hear that voice [of Jesus] and keep trying to listen to it’. I hope there are no more episodes of BBC2 series Rev. In the final episode, all the usual elements were there. Comedy – in the poorly made coffee, stolen Easter eggs and slapstick dancing. Wit – most memorably in an all too believable jargon-filled job interview – and, as Nigel surfed the web looking for dates, gentle digs at the established Church. However, this was an episode where poignancy and pathos took centre stage – in the death Bongo, in the radishes planted for the future occupants of the soon to be ‘Old Vicarage of St Saviours’, in the over-heard, prayers of the other characters – Alex Adam’s wife, Nigel the hapless lay reader and the obsequious archdeacon Robert – and recognising oneself in the worst of them and Adam, himself like a Pope of the Waste Places intoning Easter praise whilst smoke ascends disturbing the pigeons as well as a disgruntled neighbour having a lie-in. What sort of kiss was it? 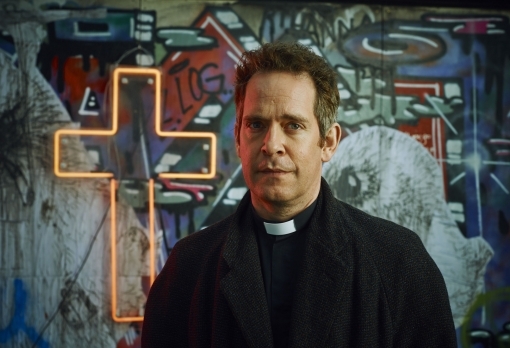 The latest in the BBC 2 series ‘Rev’ broadcast on Easter Monday was Religious Broadcasting of the most surprising kind. I lost count of the references to the last week in the life of Jesus – betrayal, jealousy, envy, hand-washing, denial, cross-carrying – all ending up on a green hill not so far away with a view of the City and a surprise appearance of God joining in with a rendition of ‘The Lord of the Dance’. 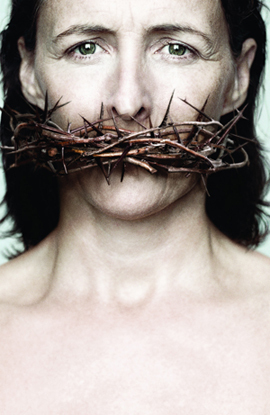 This was a passion play for the 21st Century.